Forest Hill Society: United against train service cuts! 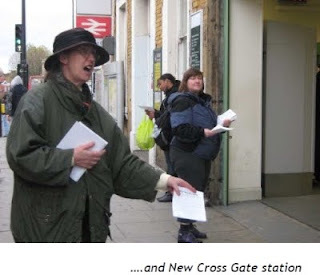 In an unprecedented show of force, volunteers at every station from Sydenham to New Cross Gate handed out flyers on the mornings of 17th and 18th November telling passengers about the proposed cuts to their services. The Forest Hill Society worked hard on this with the Sydenham Society, Telegraph Hill Society, Brockley Central and the Honor Oak Park Residents Association because only a tough, co-ordinated campaign is going to Save Our Services. We need to spread the message about the extent of these cuts and what they mean in practice which is why we’re investing so much time, effort and a little money into this fight. Many of the commuters we spoke to as we handed out the flyers were completely unaware that these cuts were being planned. Our online petition is gaining support by the hour and now has over 2600 signatures. We’re working hard with councillors and London Assembly members to see if there is any way to stop the cuts. We’ve also co-operated with local councillors of all parties to secure a clear and cross-party statement from Lewisham Council against cuts to our services. We’ve written to the Minister for Transport, both privately and in an open letter, requesting a meeting. We’ve received a reply but he has not agreed to meet us, despite multiple requests. So, why are we so strongly opposed to these cuts? Well, much as we’d like it to be otherwise, the pessimists sometimes get it right. Those people who predicted that the East London Line Extension through Forest Hill and Honor Oak Park would be at the expense of existing rail services seem to have been spot on. From May 2010, our daytime and evening peak services will be cut from six trains per hour to four per hour. Using the figures we’ve been given by London Overground, we believe that the ELLX coupled with the REDUCED rail service to London Bridge will do nothing to relieve the current level of overcrowding on our commuter services. This is because passenger numbers are expected to rise substantially – by 30% according to London Overground. Yet, once the ELLX does become overcrowded, there is no scope for increased capacity. This is because the signalling system on the core section in East London can’t cope with more trains than are currently planned. It’s also difficult to see how the operator could simply add extra coaches given that several stations along the route can’t take the longer trains. True, the ELLX gives us 8 trains per hour interchanging with the Jubilee Line at Canada Water and continuing to Shoreditch. By then, we will also have direct trains to Victoria in the morning peak. But we believe these additions do not make up for the fact that many of us will have fewer trains. And that’s not all. It is now inevitable that from December 13th Southern Railways will cut our direct evening and Sunday services from Charing Cross. There will still be four trains per hour in the late evenings but they will all start from London Bridge. There will be no additional trains running between Charing Cross and London Bridge. There seems to be a complete lack of joined-up thinking on the railways in South London.